While it certainly isn’t one of the most glamorous, your sewer system is one of your home’s most vital components. It is responsible for safely transporting waste and wastewater away from your home and diverting it to a treatment facility. Most of the time, it does its job with little intervention from the homeowner. Unfortunately, though, once in a while, trouble does arrive. And since these systems are often ignored, the problems commonly go unnoticed until they become severe. At Rosenthal Plumbing, we are here to lend a hand when things go wrong. We offer professional sewer repair in Capitola, CA, and the surrounding neighborhoods, and we can handle even the most complex sewer problems with ease. 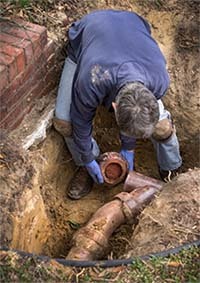 Do You Need Sewer Repair? Water backing up in unusual places. Water coming up from your shower drain when you flush the toilet, etc. Whether you have a clog in your main sewer line, a cracked or crushed pipe, tree roots growing into the line, or any other type of sewer problem, we can help. We employ only the area’s best licensed and insured plumbers, and you can trust them to tackle any sewer repair project. When you need sewer repair in Capitola, CA, or the surrounding areas, contact the experts right here at Rosenthal Plumbing. To schedule an appointment call us today. We’re available 24 hours a day, 7 days a week for emergency repairs, so don’t hesitate; call now!